There are so many topics that could be addressed about the St. Louis Cardinals after the first 10 or so days of the 2018 season, and so many are deja vu to 2017. But let’s ignore those right now. Instead, how about a bigger picture look at how some players are doing on their new teams? We all remember quite well the Cardinals off-season pursuit of an impact bat that was missing last season, and the courting of Giancarlo Stanton. It was even enough to get me to write three posts about wanting to acquire him last October, November and December. (Ah, memories … especially that photo with my December entry.) Yet Giancarlo turned downed the Cardinals, and the Giants, and decided he wanted to be a Yankee. Okay, his right — that’s why he had the full no-trade clause. So the Cards moved on, and acquired Marcell Ozuna instead. There were some Cardinals fans were who not pleased with that move and would have preferred the Cardinals acquire the third Marlins outfielder, Christian Yelich, instead. I was reminded of all these things at various times yesterday — when I saw Ozuna single with one out in the bottom of the ninth yesterday, for one thing. When I heard that Yelich was put on the disabled list yesterday with an oblique injury. And particularly when I saw that, for the second time this week, Stanton struck out five times in a game at Yankee Stadium — and heard boos from the fans as well. It made me wonder how, had he decided differently, the Busch Stadium crowd would respond to two five-K performances to start and end a home stand. My goodness, I’ve been reading a lot about you lately … and I’ll just say that I’d like to dedicate this song to you as you make decisions about your future. And, if this photo is any indication, red is definitely your color. I hope to see you in St. Louis on April 5 — I’ll be wearing my soon-to-be-purchased (fingers crossed …) Cardinals Stanton jersey. I don’t want a lot for Christmas. There is just one thing I need: an impact bat for my team. More than you could ever know. Make my wish come true! All I want for Christmas is you — as a Cardinal. Ah, October baseball! The exhilaration, the stress, the joy, the agony — and now, for two straight postseasons, watching 10 other teams continue to play throughout this month while the Cardinals are done. It was a week ago yesterday that the 2017 Cards season essentially ended, since they were eliminated from postseason contention, and it marked another step back in the Mike Matheny era. 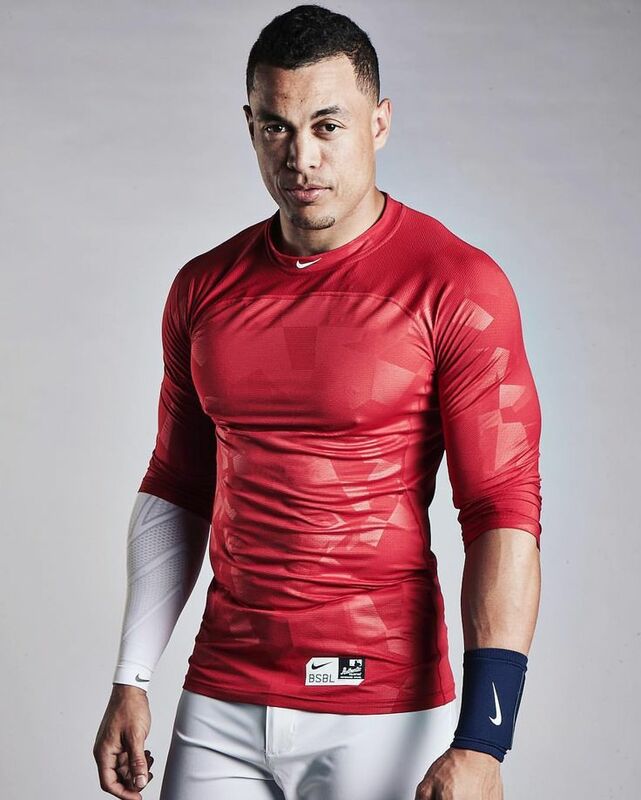 I know what I want that All-Star, that threat to look like: Giancarlo Stanton. Obviously Giancarlo Stanton would be that impact bat Mo mentioned. 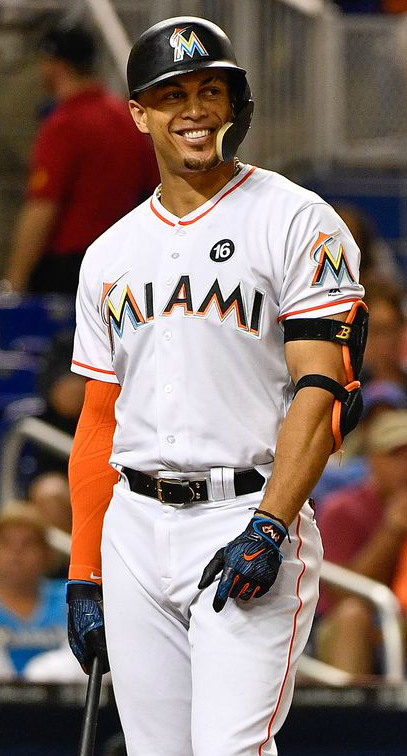 You are probably as familiar as I am with what Giancarlo did this season, leading the majors in home runs with 59 and RBI with 132 in compiling an MVP-caliber season. I am likely a bit more familiar with how he did over the final week of the regular season, because I had zero interest in watching the Cardinals play the Cubs — or, really, zero interest in watching the Cubs clinch at Busch Stadium — and then, since they were out of contention, zero interest in watching the Cards play the Brewers so I instead watched every Marlins game. I saw Giancarlo struggle at Coors Field, going 1 for 12 with a double and four strikeouts. And I absolutely enjoyed seeing him blast two home runs last Thursday night in Miami, of course, but also was pleasantly surprised to see him drive in runs in each of those four games against the Braves. He had a more complete season than you might expect, plus can make some entertaining catches in right field too. How Much Worse Can Things Get? Five Years Ago Tonight: What A Team! What A Ride!